This is a beautiful card! 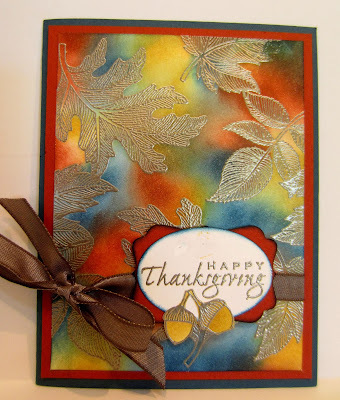 I love the bright colors on the background and the embossed leaves. I hope you were able to spend a Happy Thanksgiving with your family! The very same to you. Oh so pretty! Stunning colors and great design. This is so lovely. I'd love to receive a card this beautiful. Thank you for linking to the In and Out of the Kitchen Link Party. I look forward to seeing you next week.